We’re rushing headlong into the Festive season and it’s time to get stirring dried fruit for all manner of festive foods. In the past I’ve made Christmas cakes, puddings and even mince pies as gifts but in recent years have restricted myself to just the cakes. 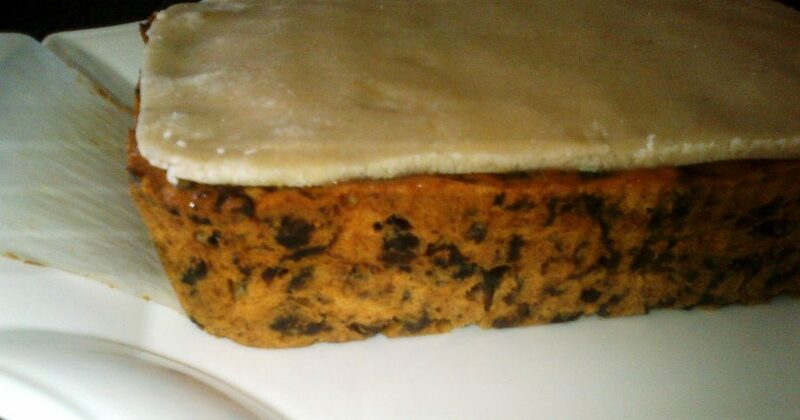 Now I’m not overly fond of fruit cake, specifically Christmas cake. I find all too often that it’s dry with a burnt, bitter after-taste – even the most expensive versions. However my family and husband all love it so, a few years ago, with the prospect of them spending the festive season with us in France, I decided to try to come up with a cake we’d all enjoy. 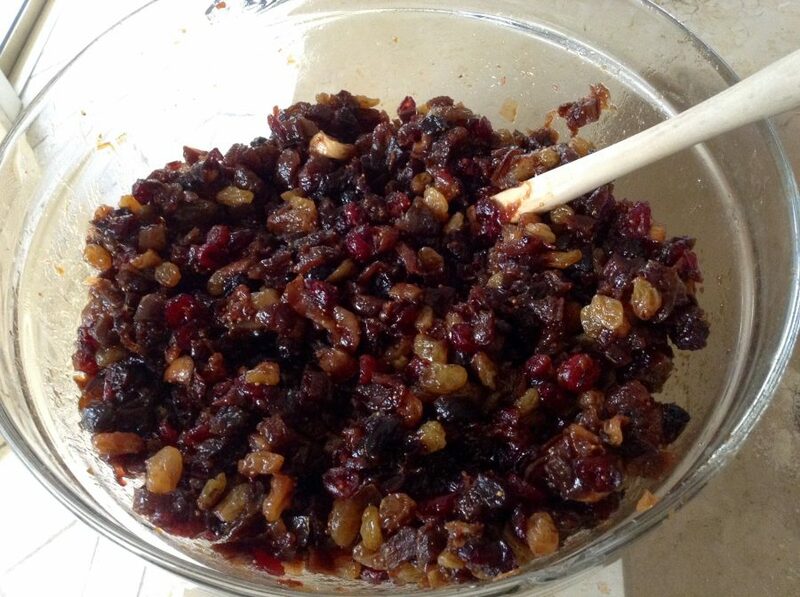 Firstly I eliminated a number of ingredients found in the more traditional recipes, such as candied peel, glace cherries, treacle, grated apple, currants, spices and nuts. Mine was only going to be made with dried fruit which I had macerated for two weeks in dark rum and honey to make it really plumptious. I cooked the cake in a shallow baking tray so that it didn’t need to bake for days hours in the oven. I then topped it with home-made marzipan and soft royal icing. It was a triumph and now my family claim Christmas isn’t complete without a couple of my cakes. I also make them all year-round, without the marzipan and icing, as the high dried fruit content makes it an ideal snack during or after a ride. The cakes have found favour with many in the pro peloton. 1. Chop all the dried fruit into small pieces and place in a large glass mixing bowl. Add the honey and half of the rum. Fold to combine and evenly distribute. Cover with cling-film (plastic wrap) and allow to macerate for at least two weeks at room temperature. Stir on a daily basis and add the rest of the rum as and when necessary. 2. Preheat the oven to 140°C/120°C fan/gas mark 1 (275°F/260°F fan). Generously butter and flour the base and sides of a baking tin. I typically use two disposable tin-foil ones measuring 18cm x 23cm x 5cm (6” x 9” x 2″) – they’re great for storing the cakes – which I line with a greaseproof paper. 3. In another large bowl, beat the soft butter and sugar together with (preferably) an electric mixer until pale and fluffy – at least five minutes. 4. Add the eggs one at a time, beating well after each addition. To prevent the batter curdling, add a tablespoon of flour to the batter with each egg. Scrape down the sides of the bowl as often as necessary. 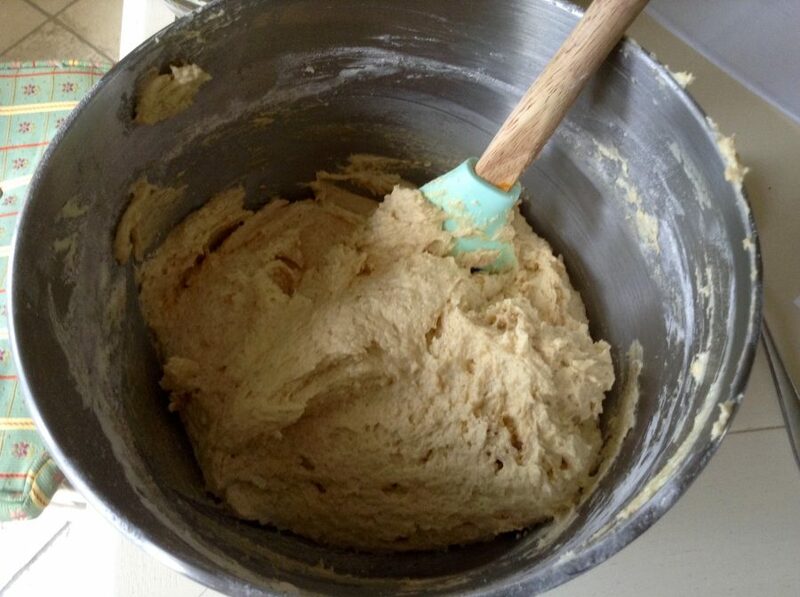 Add the rest of the sifted flour and mix gently with a spatula until everything is combined. 5. 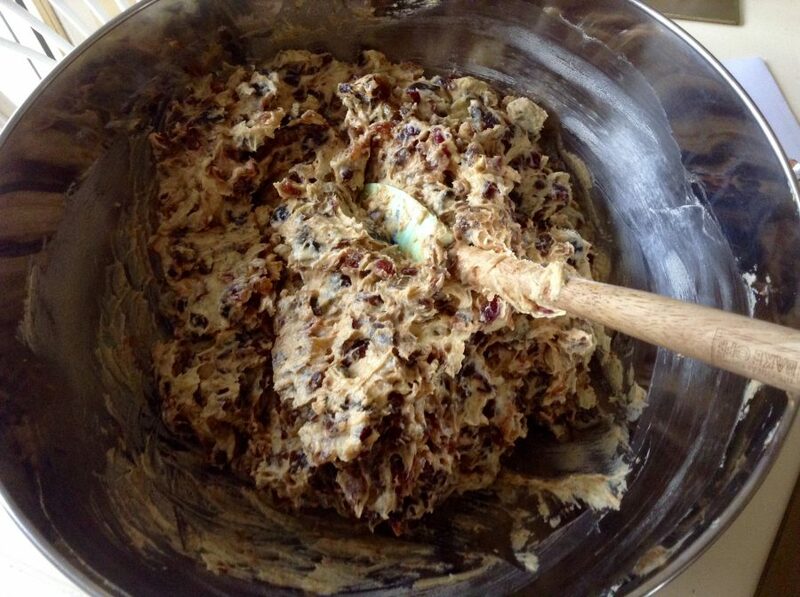 Now gently add the dried fruit in batches and mix to ensure an even distribution of fruit. 6. Divide the cake batter between the tins and level the tops with an offset spatula. Put the tins into the oven on a baking tray and cook for approximately two hours. Times will vary depending on the dimensions of your baking tins and your oven, so check regularly. The cake is ready when a toothpick inserted into the centre of the cake comes out clean. Cool completely in the tin on a wire rack. The cakes can be stored in their tins, in an airtight container, at room temperature for up to two months. 2. When I’m baking I always use a timer as it’s so easy to lose track of time. Once you’ve put the cakes in the oven, put the timer on for 20 minutes less than they should take to cook and then check regularly. 3. If the cakes start to colour too much, cover them with an aluminium foil tent. But feel free to experiment, replace some of the fruit with others which are more to your taste or even substitute some with chopped nuts. 5. If you don’t want to use dark rum, brandy works equally well or, if you prefer to leave out the alcohol, then soak the fruit overnight in warm tea, orange or apple juice. However, without the preservative effect of alcohol, the cake will not keep for as long. 6. I usually leave the cakes for at least a week before I cover them with home-made marzipan and then another day before decorating with soft home-made royal icing. I often only cover the tops of the cakes, leaving the sides bare – you can have too much of a good thing! 1. Using a blender or food processor finely chop the almonds. Then add the sifted icing sugar, egg whites and salt and blend to incorporate. It should be the consistency of sticky pastry dough. Cover with cling film (plastic wrap) and leave overnight in the fridge to firm up. 2. Gently heat 2 tbsp of apricot jam in a saucepan with 1 tbsp of water. Sieve and leave to cool before painting the top and sides with the jam. This will help the marzipan to adhere to the cake. 3. Take two-thirds of the marzipan and roll out between two sheets of greaseproof paper (parchment wrap) so that it’s large enough to cover the top of the cake and is about 5 cm thick. You can use the base of the cake tin to cut out the correct shape. 4. Then use the remaining third to roll out a strip of marzipan that is the same height as the cake. Lay the circular/square/rectangular piece of marzipan on top of the cake, and then take the long strip and wrap it round the sides. Pinch the seams together and then, before icing, allow the marzipan to dry by letting the cake sit in a cool spot for 24 hours wrapped in a clean tea towel. 5. Once the marzipan has dried, ice either with home-made royal icing or ready to roll icing. If you’re short of time and you’re going to eat the cake within a couple of days, you can simply decorate the cake with an abundance of glace fruits and/or nuts. 1. Beat the egg whites lightly and add enough icing sugar to make icing that will hold its shape. Add sufficient lemon juice to get desired consistency. 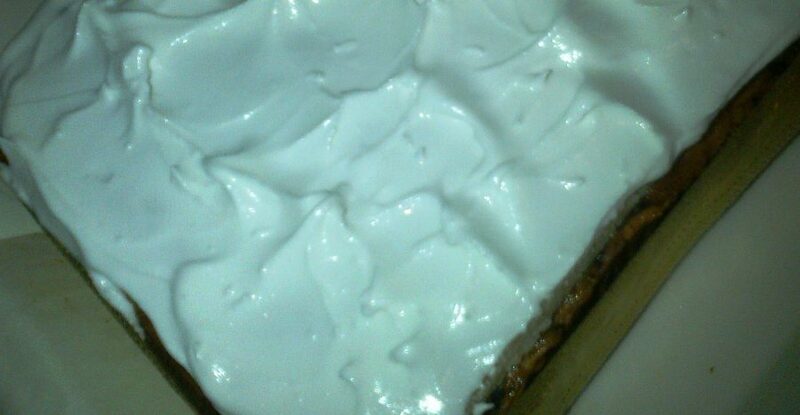 I prefer a soft icing rather than a teeth-jarringly stiff one. 2.Brush the marzipan with a bit of water and spread on the royal icing. I tend to go for a lazy snow peak effect with a palette knife and then decorate with small Christmas baubles or figurines. Now where shall I put Santa and Rudolph? 3. I usually finish the cake off with a wide ribbon and place it in a decorative tin ready for the big day.